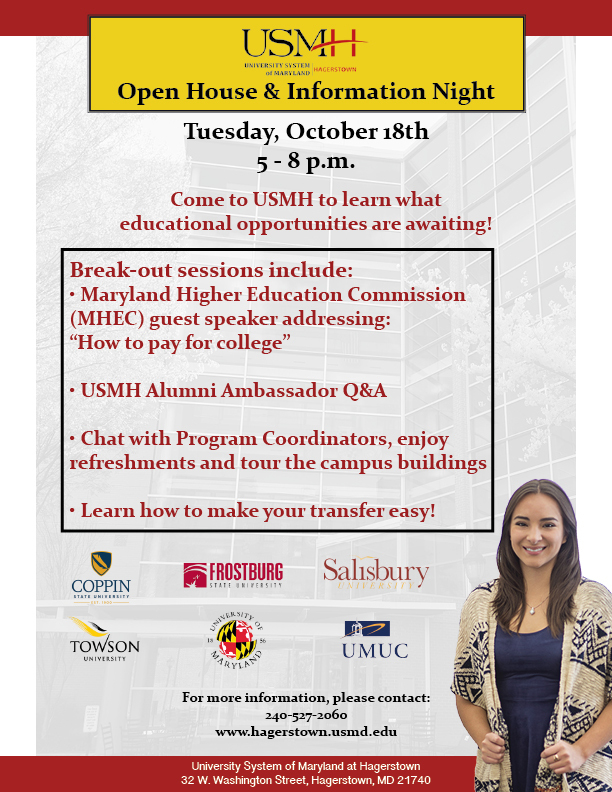 HAGERSTOWN - University System of Maryland at Hagerstown (USMH) will host a fall open house and information night on Tuesday, October 18th from 5 until 8 p.m. at 32 W. Washington Street in Hagerstown. The event will feature a guest speaker from the Maryland Higher Education Commission (MHEC) who will be addressing how to pay for college. There will also be a USMH alumni ambassador question-and-answer session. Program Coordinators from USMH's participating universities will be on location to provide transfer guidance and specific information about the programs offered. For more information, call 240-527-2060 or visit www.hagerstown.usmd.edu.